Get full access to your driver downloads for only $29.97! Special Offer - Act Now - Ends on Friday, April 19th, 2019! 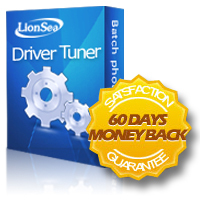 Keep your drivers up-to-date and your computer running optimally with DriverTuner! Our unconditional 60-day money-back guarantee is in full effect for all orders. Your satisfaction is our #1 goal. If you are not satisfied with your purchase, just let us know and we will be happy to provide you with a full refund.